Three Gorges (San Xia in Chinese) is a spectacular stretch of land where Yangtze River traverses Wan Xian Mountains. 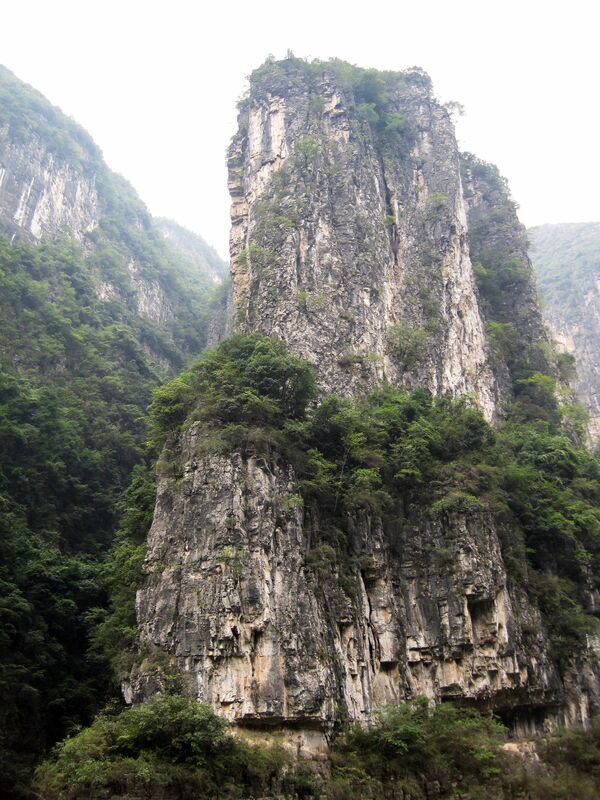 The Wu Xia Gorge is a 28 miles (45km) long stretch of Yangtze River cutting through Wushan (Witches) Mountains. Named after Wushan (Wu) it starts from the mouth of the Daning River (entry to the Lesser Three Gorges) to end near Guandukou (Badong County). 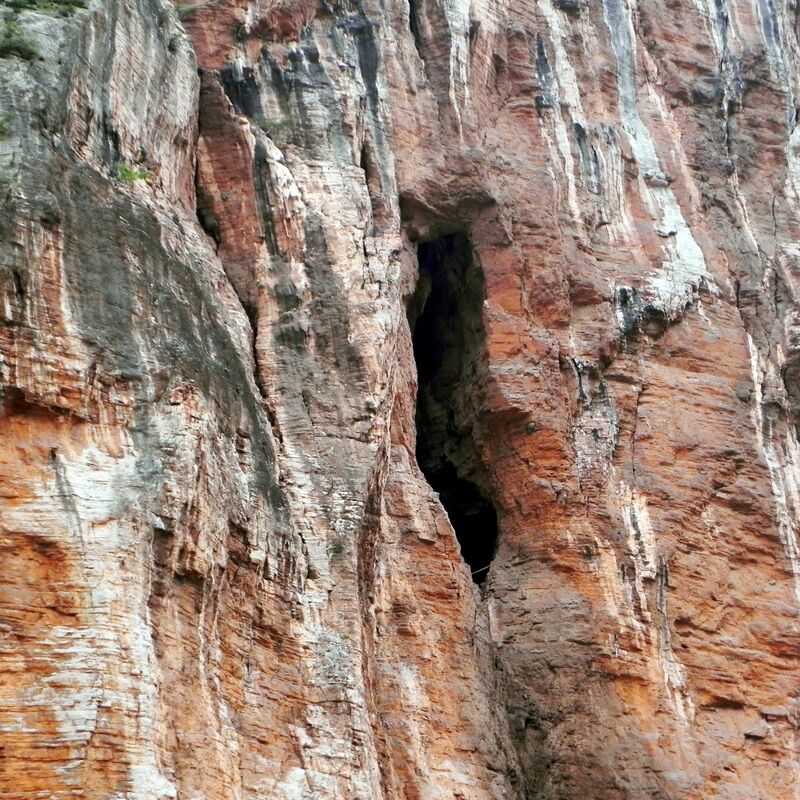 The gorge is divided into two sections – with Jinkuiyinjia Gorge on the east side and Tieguan Gorge on the west. It is the most peaceful and elegant part of the Three Gorges Tour, place of natural beauty adorned with green vegetation, waterfalls, colorful cliffs and veiled in mist…. The picturesque scenery could be well imagined by a painter, making his aquarelle with smooth strokes of brush from the palette of countless colors…..
Twelve Peaks are probably the most spectacular natural attraction along the Wu Xia. They form the steep wall flanking both sides of the water passage with six peaks on the northern bank: Denglong (Climbing Dragon), Shengquan (Holy Spring), Chaoyun (Morning Clouds), Shennu (Goddess Peak), Songluan and Jixian and remaining six on the opposite bank with visible Feifeng (Flying Phoenix), Cuiping (Misty Screen) and Juhe (Crane) Peaks as well as hidden behind - Jingtan (Clean Altar), Qiyun (Rising Cloud) and Shangsheng (Ascent) peaks. Water course along the Wu Gorge seems to be blocked by the wall of mountains forcing Yangtze River to frequently change its direction. Hanging in the air mist and low clouds largely add to the mysteriousness of the place. Predicting direction ahead is a guessing process…. 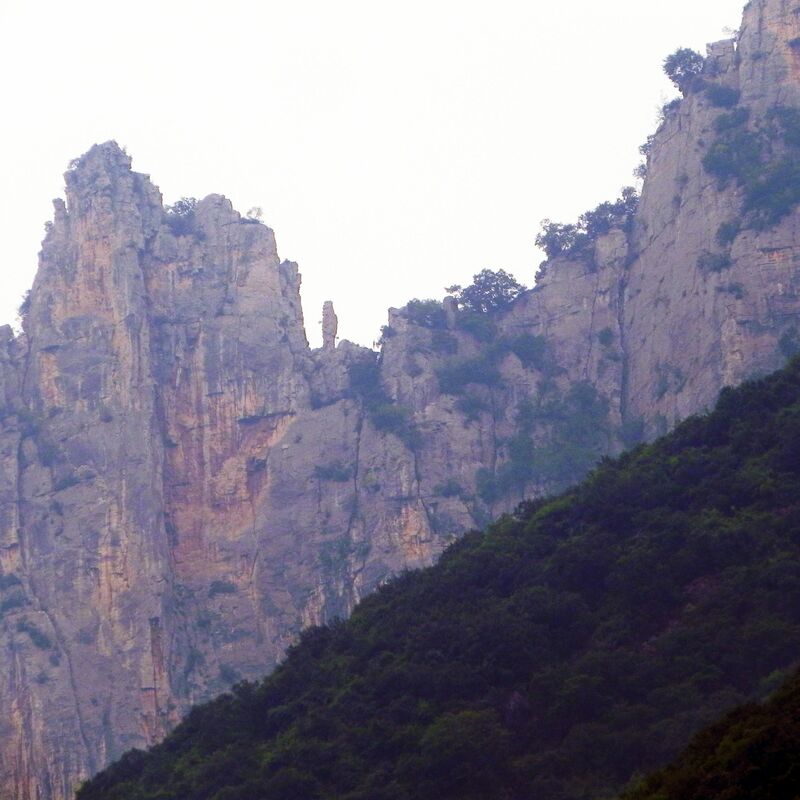 The whole group of peaks is dominated by the highest one – Denglong, towering the gorge with its almost 4,000 ft (1,210 m) of altitude. But the most famous is Shennu Peak called also Goddess Peak - a single pinnacle in the shape of a young girl looking down on the river. For centuries Twelve Peaks were inspiration for poets, painters and storytellers. Their “heavenly poetic” names reflect imagination of generations living around or traversing the gorge. According to one of countless legends “floating in the air” – the Goddess Peak represents the earthly body of Yao Ji (youngest daughter of the Heavenly Mother). May be thanks to this “heavenly incarnation”, the Mother Nature made it the first among twelve peaks to be gently touched by sunrise’s light and sunset glow? Another witness from the past is the Kong-Ming Stele – a white stone-tablet on the cliff below the Jixian Peak. Kong Ming Stale - today half submerged in the water, in the past was hanging high above the river proving skills and bravery of craftsmen…. 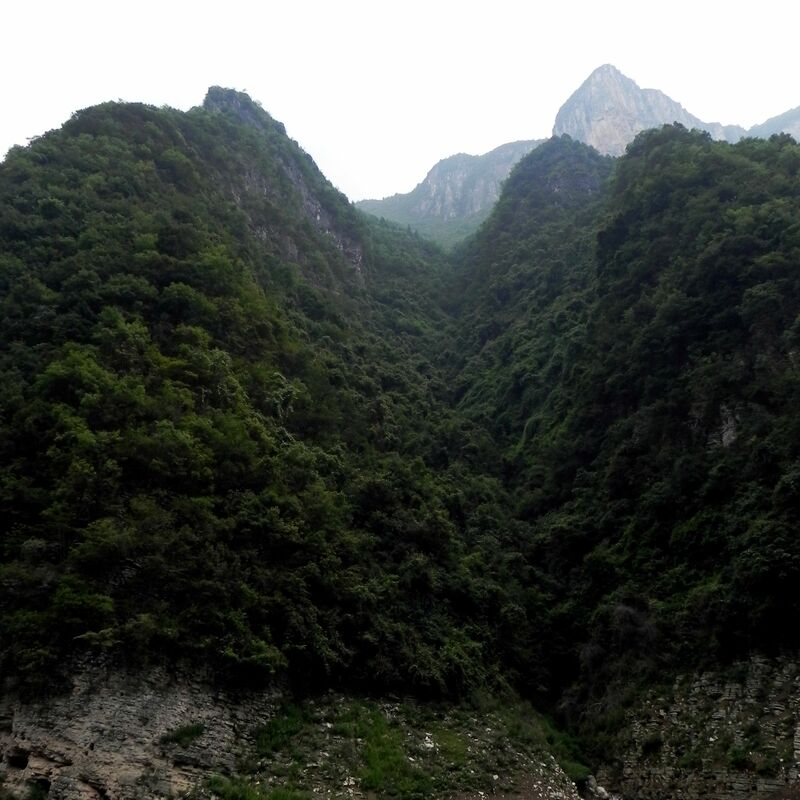 The Wu Xia Gorge cuts through mountainous landscape with many deep valleys and high peaks. Such dramatic landscape creates the “local” microclimate characterized by mist, clouds of fog and drizzles. Needless to say that it truly makes Wu Xian the magic place. The Wu Gorge is confined between two tributaries of Yangtze River. On the east side of the gorge the Danning River merges with Yangtze while on the west end of the Wu Gorge it is the Shennong Brook. Both tributaries create their own wonderlands of gorges and valleys as a natural extension of misty elegance of the Wu Gorge. It is the longest one of the Three Gorges extending from Xiang Xi (Fragrant Stream) some 41 miles (66 km) down the river to Nanjin Pass near Yichang. It is (was) also one of the most dangerous segments of the Yangtze River with strong currents, powerful whirlpools and submerged boulders rapidly changing directions of the water flow…. For those reasons it was nicknamed “The Passage of Death”. The Xiling Gorge is actually composed from few distinctive gorges with names reflecting local legends, historical facts and inspiration fed by shapes of rock formations. So there is Military Books Gorge (layers of rock resemble stacked books on the shelf), Precious Sword Gorge (Bingshu Baojian Xia) taking from heroes and legends of Three Kingdoms, Rice Granary Gorge (MicangXia), Horse Lungs Gorge (sadly, part of the characteristic rock formation was destroyed by British gunboats about hundred years ago! ), Kongling George, Yellow Ox George, Lantern Shadow George (Dengying Xia) to name only few. Three Gorges: It is true that since the "beginning of time" Yangtze's passage through the mountains inspired generations of poets, but also since forever, Yangtse was a Main Street of China, major waterway for transport of merchandise. In the past (before the dam increased the water level) the most dangerous rapids along the Xiling Gorge included Kongling Tan, Qing Tan and Xin Tan. Due to huge boulders and treacherous currents, these sections of the Xiling Gorge witnessed countless tragedies, wrecked boats (including even several “modern-day” steamships) and innumerable losses of lives…..
Fortunately thanks to the recently built Three Gorges Dam and its older sister - Gezhouba Dam located down the Yangtze River near Yichang, most of deadly swirls and treacherous shoals disappeared. What stays unchanged is the beautiful scenery that for centuries amazed travelers and inspired poets…. High peaks and steep cliffs on the banks of the Nanjin Pass mark the end of Yangtze’s upper section. It is also the beginning of the middle section with landscape gradually changing to lowlands and the Chang Jiang ("Long River" as Yangtze is called in China) getting wider... . In a way, the Nanjin Pass mirrors the western entrance to the area of the 3 Gorges symbolized by the Kui Gate.